Transcend is the world's smallest, lightest and most portable CPAP system! Weighing less than a pound, Transcend fits in the palm of your hand making it ideal for travel, or for every night use at home. The new Transcend Sleep Apnea Therapy System has flexibility unlike any other CPAP. For the first time, you get to choose how you want your CPAP to work. The Transcend Sleep Apnea Starter System is the base of the Transcend Sleep Apnea Therapy Systems. This portable system comes with the world's smallest CPAP and a Universal Hose Adaptor and standard 6' hose that make your Transcend compatible with any mask. By upgrading to one of the patent-pending Transcend Waterless Humidification options you can sleep comfortably anywhere with no water, no hassle, no cleaning, and no mess! The optional H6B System comes with a proprietary HME-compatible mask and 6' air delivery hose to provide broad flexibility for use. You can place Transcend on a bed stand, in the drawer, on the floor, or even next to you in bed! The optional H9M System gives you a wearable CPAP option that provides the most freedom of movement of any CPAP on the market. The H9M system comes with a proprietary mask and a short, 9-inch hose that allows you to roll over in bed without the discomfort of hose pull. 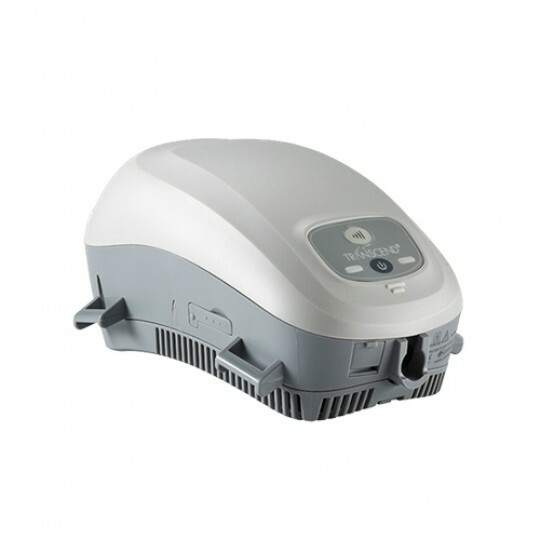 The H9M system is the smallest and most compact CPAP option on the market. The hygienic heat moisture exchanger (HME) cartridge is disposable and has no electric elements. HME technology works effortlessly with you as you breathe to give you the humidification you need. When you exhale, the HME captures the warmth and moisture from your breath while CO2 passes through the filter and out the mask vent leak. Then, when you inhale, the HME warms and humidifies the air as it passes through the HME filter. It's a simple, natural and effective solution to the traditional heated humidifier. With Waterless Humidification there's no cleaning, no distilled water, no break downs, and no malfunctions. Just the humidification you want. The small and lightweight Transcend P4 Overnight and P8 Multi-night Battery Systems let you sleep anywhere with the comfort of knowing you will have power to get you through the night, whether sleeping under the stars or snoozing through a power outage at home.